very prominent in this area. managerial reports such as budget estimation. documentation etc., to the Air Force end article prime depot. Number," and S-00-1-2, "Federal Stock Number to Part Number." is used for the processing of weather data. computation of old-age, survivors, and disability benefits. settlements consisting of approximately 9 million bales per year. control acquisitions, maintenance and disposition of CCC owned cotton. accounting, budgetary, and general management needs on an integrated basis. The inventory consists of approximately 1.3 million bales records. accountability on national basis for the acreage reserve sight drafts. Approximately 500,000 drafts per year. in excess of 2 1/2 million records. New Orleans computer on a data processing center basis for this application. ing of grain through the use of linear programming techniques. for special mailings to customers. tomers who are in the most part billed bi-monthly. for use by our customer contact people. quality control, and requirements generation. International Harvester Co., Motor Truck Div. quarterly and annual state and federal reports. 20,% of the bank, the necessary modification documents are prepared. schedules to determine if a forecast revision is necessary. number requirements for next 5 days by assembly locations. tion and involve performance study and stress analysis. prepared on time spent on assigned projects. character of a record being individually addressable. Automatic built-in subroutines include store-for-print and transmit. and report/file writing, decision making and Fortran. written by stating the data processing involved. expressed in statements closely resembling the language of mathematics. writing and computing are possible. Mylar is DuPont's trademark for its polyester film. 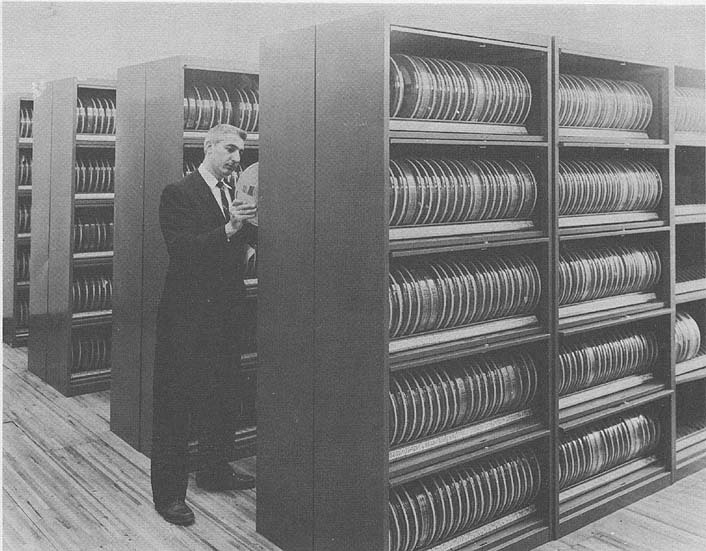 40,000 character magnetic core; 19 magnetic tape stations. on line for control of a maximum of ten Type 727 Tape Units. Punch cards converted to tape in off-line operations. The printer and punch are used off line only normally. microfilm and punched cards in off-line operations. 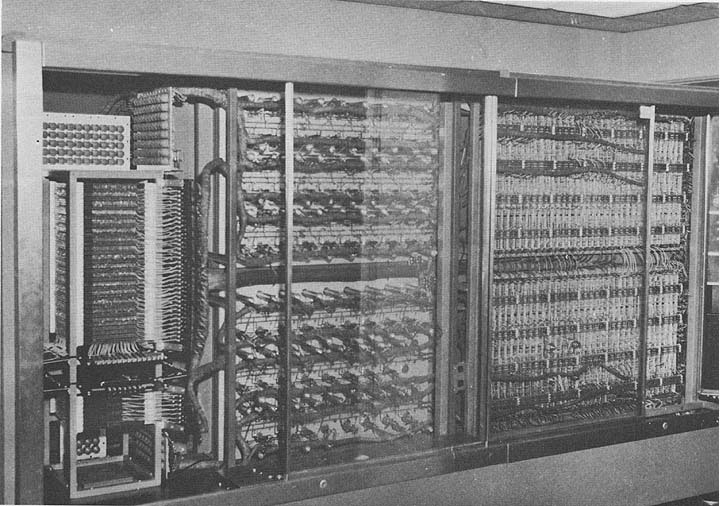 13 IBM 727 Tape Units connected to main frame. Off-line card to tape, tape to punch and tape to printer. Physical planning manual is available. First floor location prepared with false ceiling and raised floor. air core transformer used exclusively for the computer. distribution panel in the computer room. and associated switching gear. Separate air conditioning system. system are provided with hoods to exhaust the heated air. installed to permit loading and unloading of machines. ceiling - warm air return thru ceiling plenum. Manufacturer Only limited production at present. Delivery on availability basis only. Prime shift rental amounts to $50,210 per month. charged at 40% of prime shift rental. Type 777 Tape Record Coordinators, 13 Type 727 Tape Units. Base rental for 176 hrs/month is $34,420. two Type 722 Card Punches, six	a 727 Tape Units. Base rental for 176 hrs/month 119,860. Maintenance is included in rental cost. System is rented. Rental includes maintenance. Total prime shift rental is $56,600/month. as assistance at all levels. Input-output operators double as tape handlers. Operation tends toward closed shop. the field of 705 programming. Additionally, the remaining 4 bra. Representatives and Programming Section Supervisors. the operation of the system. off of the machine and is responsible for over-all planning. debugging. All other operating is done by the Report Processing Branch. Engineers are employees of IBM. Service is included in rental. Methods of training used includes IBM schools and on-the-job training. Computer operating personnel rotate over the 3 shifts. training under our own supervision. being done currently and amount of work planned for the future. as new applications are installed. Figures are for basic system only. III during June 1959 is 85%. to permit the completion of work to meet established deadlines. include reruns necessitated by erroneous input data. with the study of possible uses. departments in Endicott and Poughkeepsie, New York. programming and necessary operating details. coding methods and assembly programs are available. cross country shipments of magnetic tape. outstanding feature is microsecond interrogation. 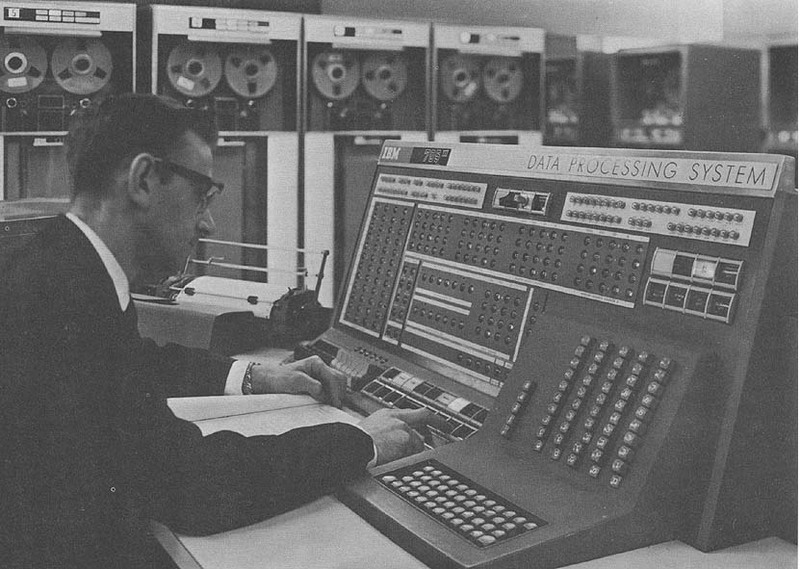 AFB, Japan, has 1 IBM 650B. plastic sticker on the reels identifying the information which the reel contains. an out of town records center. visual identifications and expiration date. Tape stored in fireproof vault. to minimize effect of catastrophe in computer area. as 705 I, 705-2 or 705-3 with 754 Tape Control or data synchronizers. labels written and tape reels physically labeled. determine whether scratch tapes do not have label from prior processing. racks hold reels which are arranged by applications. Shipping: No requirements for shipping tapes between locations. temperature and humidity throughout the building. the ceiling of the machin8 room. These are set to bring in an alarm at 225oF. protection. The building construction is as fireproof as possible. program compatibility to the 7080 Data Processing System. on order to replace all peripheral equipment listed. such as; sorting, editing, etc. Replacement of all input-output units by six 1401 Systems. Replacement of 705's by 7080's. 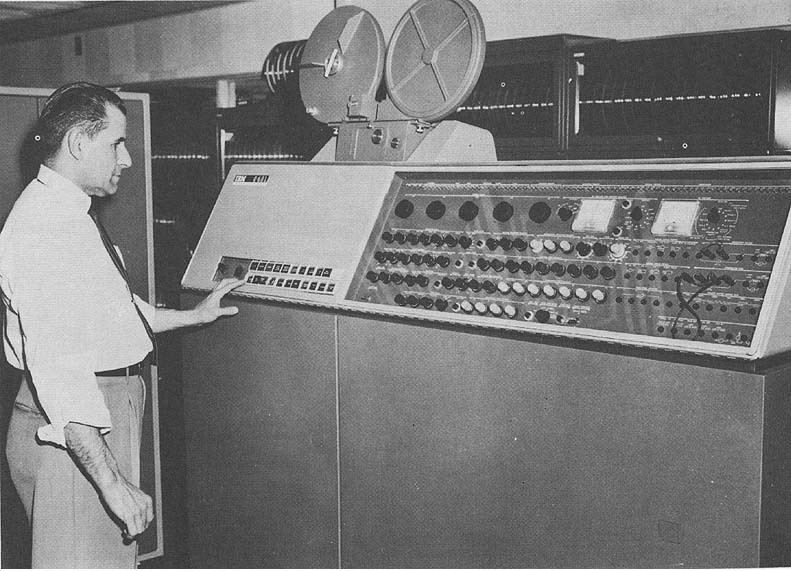 An IBM 1401 is planned for installation. (this will eliminate the magnetic drum. 1 IBM 7080 Computer - to replace the 705 III. over the present manual system. control and production planning and scheduling. 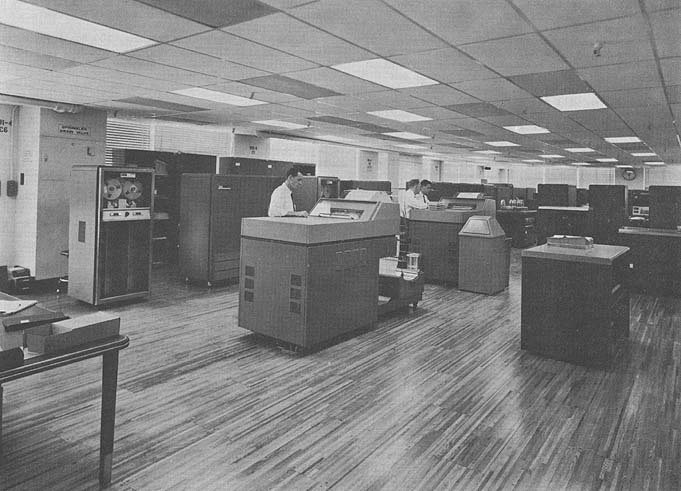 1401 Tape Systems and two IBM 7080 Computer Systems. problems requiring less speed and storage. Plan 1401-C to replace present peripheral equipment. D Street, S.E. Washington 25, D. C.
Commodity Stabilization Service U. S.